Ball Valves are used to start or stop fluid supply. Ball valves find application in Hydraulic, Pneumatic and Hydro equipments. Ball Valves available in market are robust in design suitable for open to environment application. Matchless make Ball valve is a compact design suitable for hand held Pneumatic equipments such as Yarn Suction Guns. These Ball valves have long operating life due to their indoor application. Ball Valve assembly consist of Housing, Ball, sealing, O rings, gland and handle. In case the Ball valve starts leaking during operation, you have to shut off the compressed air line and remove the Ball valve. By rotating the gland you can dismantle the Ball valve. Check the O Ring and gland. If O Ring is torn then you will have to replace the O Ring. 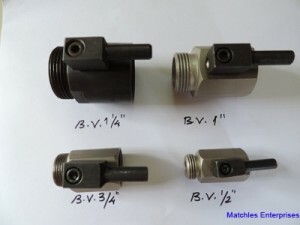 If the Ball Valve gland is worn out due to extensive use then replace the same by a new one. Assemble the Ball valve and test the same. 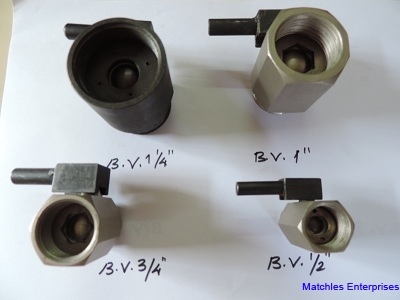 We supply spares for Ball valve and undertake repairing and servicing as well.